Homeschool Day Book–Pt 2–In Use! 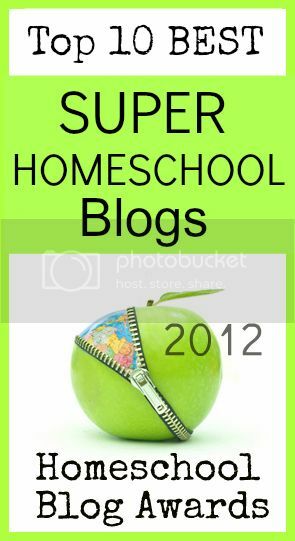 I have a new to me product to tell you about – Homeschool Day Book. I downloaded their free trial last week – they give you 30 days to use it. So far, I’ve needed only 5 to know it will work for me. First – the startup is just about the easiest I have seen. 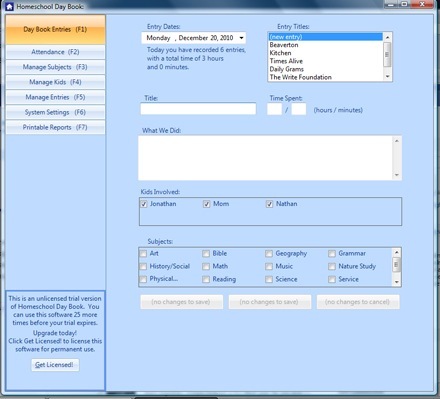 With Homeschool Day Book – Easy Peasy. Ok. I’ve got to go get my glasses on. Better. Thanks for hangin’ in there – where was I. . .Downloading. It downloads complete. I clicked on Manage Kids and spent all of 20 seconds adding Jonathan and Nathan. Then I clicked on Manage Subjects and played with them a bit. It does come up with the standards pre-loaded. I’ll need to send an email to Matt to tell him that Nature Study should be on the preloaded list. 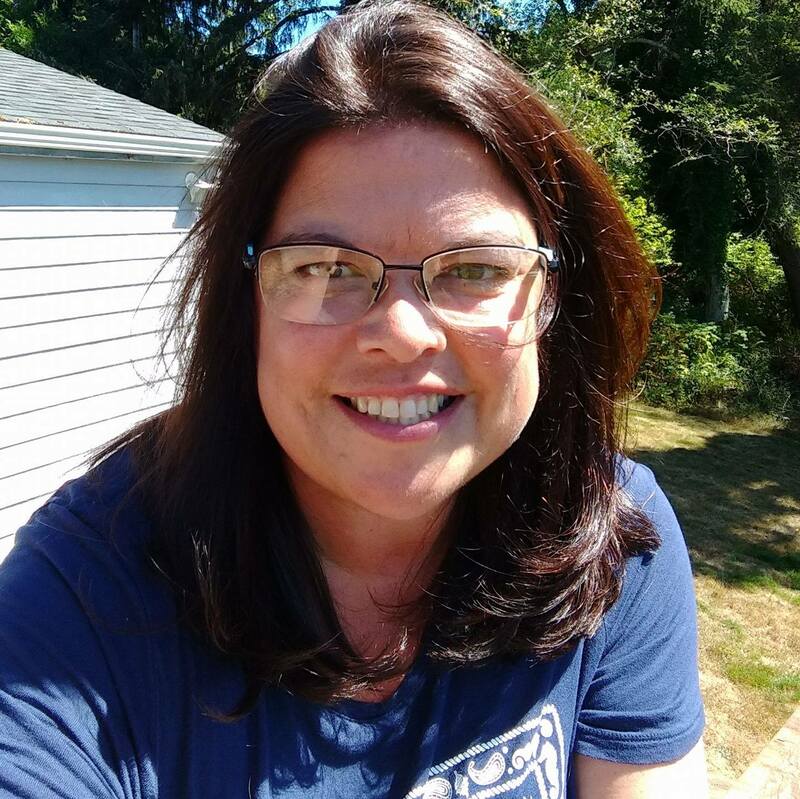 . . . .
After all the struggles of what I shared on Part 1 What I learned – is that what I need is something that will keep me accountable – be easy for me- even if it is written on post it notes. I’d like to be able to show myself that I have either been good with my priorities, or show where we are lacking. I’d like a way to show LIFE, and not Scope and Sequence. I’d like a program that will help us plan with God’s Plan, and not keep me guilty for not following Man’s Plan. Focus – From here is where I had difficulty completely liking the program. The language is set up in “What We Did”. I need a “What we will do” program. One of the selling points on the website is that it is very simple, very basic, an very adaptable to any school style or family size – so I thought I’d give it a try. I typed in the “What We Did” block style for Morning, Afternoon and Evening the day before. Three Entries. Our whole day. That was easy. The next morning, in a manner of moments – I typed in “What I’d like to Do Today” style for each child. Played with the Titles a bit – The subject says Math – so I typed in Aleks or Mastering Math Essentials, and what they were to do on the “What we did” Section. The last few days I’ve been playing a bit with the Title part, I might play with the Subject Entries to say “Math, Aleks” as a subject, or “English, Daily Grams”. However, that pulls from that crazy need to have the tool justify the academics – it isn’t needed for any record keeping. . . . . 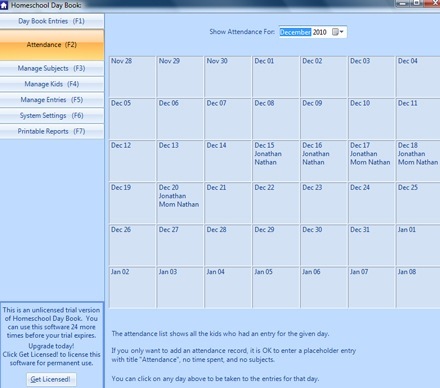 The Attendance screenshot gives the names of who has entries for the day. I used my brain power to figure out that I could create entries ahead or behind today – I could copy and paste my own text for “do the next page” type entries. 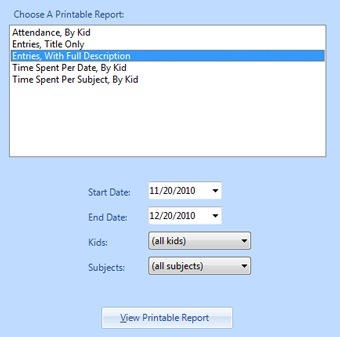 If you have a state that requires you to show attendance – he gives you the tip to create and Attendance Entry for each day, without the time of typing out your scope and sequence. 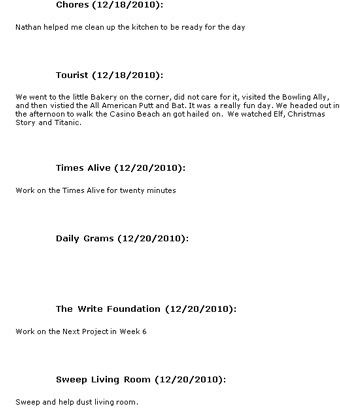 Friday was a pretty packed day with out of the home activities, so I sat that morning and typed out what I’d like to do – then printed the entries with full description for each child – the report showed our activities, needed seatwork academics, and chores for the day. My boys like to mark off lists – so they really liked it. 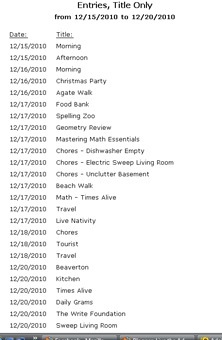 My youngest flowed with the day without looking at the list, and made his normal supermarket comment of “we didn’t do school today”, and when I showed him the list – I got to remind him that not only did he accomplish a lot today – it was planned for him beforehand –and he was doing great. He sort of marveled at all the things I had written out in the morning that had taken place during the day. I think it gave him a sense of accomplishment. I’m not sure he sees how much I mentally plan for each day. Reports are pretty basic, but for our needs they work. If you had more than two kids, it might be a pain to have to write their names on top if you print them as a “to be done” page. If you print Entries Full Description – you probably will have to tweek the Subjects and Entry Titles to best convey what you want done if you don’t want to fill in a lot of detail in between. If you want a list of hours spent it works Great. We don’t normally have colored ink on hand, and cherish the black ink, so I love how the list is very simple, without embellishments – and gives space to write notes if needed. One thing I saw today was the ability to Save the List to an Excel or PDF file. Very Cool. Especially if you live in a state that requires Homeschool Tracking of Hours or Subjects. I am quite happy to share this new to me program with you all. I think You’d like the free 30 day download to see how you can tweek it to fit your needs. It will not guide you through planning your day, and it will not set up your Scope an Sequence Curriculum for you. You will still need other tools to help you with that – but – so far – it is the easiest way to keep track of an almost unschooled relaxed learning day on the computer, and keeping me on a focused track. For me and my lego lovin’ dart shootin’ boys – it is a good fit. Fyi- I was not paid for this review – and I would have shared it either way – but for a limited time – if you are a blogger, and try it, and write a review – Matt will give you a free license key – he wants honest reviews – love it or lump it. I say – Love It. This entry was posted in Lego, Planning, Some Schooling and tagged Home School, Homeschool Day Book, Lincoln City, Oregon, Planning. Bookmark the permalink. 5 Responses to Homeschool Day Book–Pt 2–In Use! so I don’t do anything with it- as there are no absent days at home. I have a bunch of planning to do for January though. It’s “J-Term’ here. thanks for stopping by. I actually clicked on your link from The Hop last night, but it took me to an email page. So I’m glad you left me a note so I could find my way here. I use Gmail Calendar a lot, it color codes and sends email reminders for appointments. I need to use it more I think.